Here's what's wrong with Marvel's comics: the writing has taken a back seat to the art. It's a common mistake - plenty of other companies have made it, and Marvel has made it before. To clarify, some editors apparently think the only important thing about a comic book is the artwork. 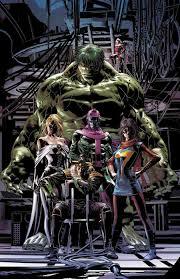 Take the new Infinity Wars series, for example. The art is amazing. You get the sense that Mike Deodato, Jr., realizes that the story makes no sense, so he's trying to make up for it by pulling out all the stops with amazing, over-the-top imagery. But as they say in the theatre, "If it ain't on the page, it ain't on the stage." You can't expect a comic series or event to succeed if the story makes no sense. So this series has Gamora seizing the Infinity Stones, supposedly to free a fragment of her soul from the Soul Gem - but instead, she's embarked on an exploration of... well, some kind of barrier between realities. And she sent a number of heroes into the Soul Gem, where they find duplicate Infinity Stones. And she "folded" the universe, merging heroes together into new Amalgams (heh). Why are these things happening? No idea. And that's just part of the crazy goings on here. Look, I've been reading comics forever, and I can't make hide nor hair of it - and this is not uncommon in Marvel's comics these days. Until they put the focus on hiring the best comic book writers available (as they did during the Marvel Knights line that hit 20 years ago), they're going to continue to drive readers away. We're here to be entertained, not insulted.